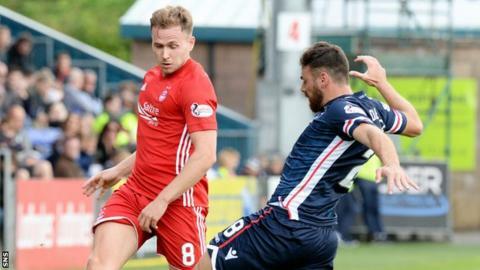 On-loan forward Greg Stewart welcomes the challenge of securing an Aberdeen starting place as they look to maintain their perfect Premiership start. Forwards Ryan Christie and Gary Mackay-Steven began last week's 2-1 win over Dundee, with a third new signing, Stevie May, scoring both goals. "When you join a club like this you know there is going to be plenty of competition for places," said Stewart. "The gaffer has rotated it quite a lot trying to keep things fresh." Stewart, 27, replaced Mackay-Steven 12 minutes into the second half of the game against former club Dundee to make his eighth appearance of the season. He has started four of the Dons' matches but completed only one, with manager Derek McInnes replacing him twice with midfielder Greg Tansey and once with fellow forward Scott Wright. And, having been used as a second-half substitute on four occasions, replacing Kenny McLean, Christie and Mackay-Steven, the on-loan Birmingham player recognises the fight for places in the team. "Aberdeen has done so well the last several years and it's a massive club. It was my turn to miss out last week," he said. "I just need to work hard in training and hopefully get back in. There's a lot of good players here so when you get a chance, you need to take it. "Even though we won, the manager will still change the team depending on the opponent and what he thinks is the best way to get the three points. "He's already told us: 'It doesn't matter what happens on the Saturday - if I think it's the best decision then that's what I'm going to do'. "That's his job. Sometimes he'll get it wrong but hopefully most of the time he gets it right." Stewart said it was a "massive incentive" to have the chance to make it four successive league wins against Partick Thistle at Firhill on Saturday. "We just want to keep on winning games and once you get into that routine, it becomes a habit," he added. "We're not thinking anything less than three points on Saturday. "We've not played at our best yet. We know the potential we've got in this squad. If we can play to our maximum we will hopefully get another win." BBC Sportsound coverage as Scottish Championship strugglers Partick Thistle take on promotion hopefuls Ayr United.